Entdecken Sie die Normandie und das Loire-Tal auf dieser 2-tägigen Tour ab Paris. Besuchen Sie das bekannte Mont St. Michel, und bereisen Sie das Land der Schlösser, um bekannte Bauten wie Château de Chenonceau und Château de Chambord zu besichtigen. Ihr Reiseleiter wird Ihnen bei den Führungen die Geschichte dieser absolut sehenswerten Regionen und Sehenswürdigkeiten nahebringen. Wenn Sie nur einen kurzen Aufenthalt in Frankreich haben, ist diese einfache Tour ab Paris eine fantastische Möglichkeit, mehr von diesem wunderschönen Land zu sehen. Übernachtung und Transport im komfortablen Reisebus sind im Preis inbegriffen. The tour was ok we saw all of the highlights but we didn't have enough time at any of the places. The company that does this tour is super organized. Everything went as planned and we saw and learned a lot of cool things. My only complaint is with the nature of a big tour like this. There is a lot of bus travel and the time at the sites is very limited. We had to rush around after the guided parts to see anything else. The planned meals weren't that great, I would rather not have that included and instead just leave time for folks to eat on their own. The hotel was fine, the breakfast was great. It's really cool that they accommodate so many different languages. If you don't want to drive yourself, this is a great option. It was an amazing tour. The places are gorgeous and the guides were very nice. To get a lot in within a few days this was great! The guides were knowledgable, pleasant and made sure everyone e was looked after. I would definetly recommend this trip. 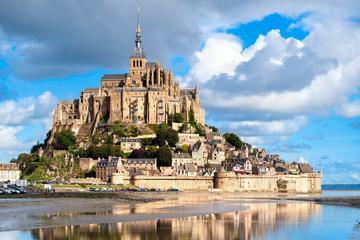 I loved seeing the Mont Saint-Michel and the Loire Castles. Wish they would have told us ahead of time that due to the time schedule we would not be seeing the Mont Saint Michel at high tide and therefore missing it being surrounded by water. Also, because of the time schedule we felt rushed a lot. They would say there will be plenty of time at the end to take photos, but that never seemed to happen. Also, a lot of times it felt like we were huddled in a corner and told about what we were going to see and then we would rush by what we were seeing. That being said, other than renting a car, I don't see any better logistics for the trip. Unfortunately our tour coincided with a holiday weekend so all the destinations where crowded and rushed. Check for local holidays before booking. This tour was excellent! We saw many wonderful chateaus and the hotel for the overnight stay was very nice as was the dinner provided. The guides were very knowledgeable but the headsets could be better. I would recommend this tour to everyone! Caroline was an excellent guide and host during our visit to Mount St. Michel. She has a very good grasp of the history of the region. We enjoyed ourselves emensely. Very well worth the time and money spent to make this visit. It was a very good tour. Very Informative. The fact that we had to change buses twice was a the reason why I wont give it five stars. Overnight stay was in a good hotel. Included meals were good and tasty. We had the option to eat chicken both times. Not sure how many options will be available for Vegetarians.